Formerly Community Markets, this company founded by a husband-and-wife team of “locavores,” runs 20 farmers markets that bring the freshest seasonal local produce and foods to New York City and Westchester and Rockland Counties. We began with name and logo development. 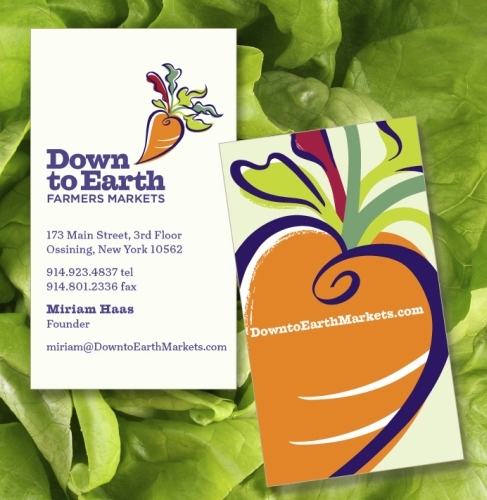 The client chose the name “Down to Earth” and commissioned us to create a fresher, friendlier update of their existing carrot logo. A consistent campaign: Small-space and click-through ads run in local papers and magazines and on various listings websites. Vegetable and fruit illustrations by Steve Salerno. Banners on Ossining’s Main Street. Brand book demonstrates signage standards for the markets. Are your customers your best advertising vehicles? Vendors and customers wearing Down to Earth hats, buttons, shirts and tees and carrying shopping bags can spread the love far and wide.